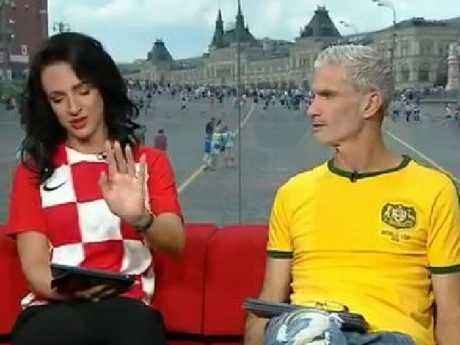 SBS host Lucy Zelic fought back tears prior to kick off as she reflected on the enormity of Croatia making it to the World Cup final - and the waterworks came flooding back after full-time. Zelic was targeted during the tournament by viewers and social media trolls who object to the way she makes a point of pronouncing names the way they would be said in the player's home country. But SBS colleague Craig Foster - who came to her defence earlier in the tournament - had only kind words to say before the network's broadcast came to a close after France's 4-2 win. "Finally Luce, can I say well done to you. It really has been an extraordinary performance that you have given this World Cup," Foster said as he teared up while comparing her influence to that of Croatian star Luka Modric, who won the golden ball for player of the tournament. "You have orchestrated it for us right throughout the World Cup and you have been the best player of this World Cup. Can I say it's been a privilege to see you really grow through this World Cup. "You came here and it wasn't easy to come and sit here on this couch after Les had done it but you did it in an extraordinary way. You were brave, you faced personal challenges throughout as well. And all of Australia has grown with you through this tournament and we are extremely proud of what you have done. Zelic was moved by the touching words. "We have got you a little bunch of red roses which, as you know are very symbolic for SBS. These are the roses that Les loved … and he used to say it is important to smell the roses. "What you have done, we have watched you grow and inherit this role and do something extraordinary." "I'm so touched and honoured to work with the both of you," she said. "I'm only as good as the people around me and to be blessed with colleagues like you, who have always done nothing but respect me and shown me an enormous amount of support and appreciation, and you know that is something that is truly special and I know that not many hosts can experience that. "It just doesn't feel right without him (Murray) but Foz … you need to be appreciated because what you have done in the absence of him, what you have done in the time that he was there at SBS needs to be expressed. It needs to be appreciated and respected. "You are a shining beacon not just at SBS but for the game in Australia." Lucy Zelic fought back tears before the game too. "They've used that adversity to channel it, it's deeply ingrained in their DNA and their culture and it's also the rhetoric that comes out from (coach Zlatko) Dalic, from the players," Zelic said before reading a quote from star Ivan Rakitic. "'It doesn't only concern the 23 players, our coach, the staff, physios, doctors, journalists - but the 4.5 million people back home,'" Rakitic said in a pre-match press conference. "'It's with incredible pride and joy we were lucky to reach the final but we've shown this kind of commitment each game.'" That was when Zelic started to lose it. "I'm sorry, this is the line (from Rakitic) that got me," she said as the tears started to flow. "'If there was a stadium big enough for 4.5 million people it would be full,' and I'm sorry, apologies (for crying). "It's a really big deal for the Croatians, for the players and what it means to us."